There’s no place on earth quite like Key West, especially during the winter. While the weather does get a bit milder from November through February, you’ll still experience bright sunny days and refreshing ocean breezes. Fun activities and special winter events are in no shortage. Read on for the top things to do during winter in Key West. For a truly relaxing and festive Key West experience, head over to Mallory Square and board the Old Town Trolley. Sip cider and indulge with holiday cookies as the Holly Jolly Holiday Trolley transports you through the city in search of the best holiday light displays. You’ll even be given special holiday lights glasses to ensure you enjoy all the sparkle. This 1-hour tour runs on select days throughout December. Another great way to get in the spirit of the season is aboard the historic Conch Tour Train. This special Holiday Lights Tour will journey around the island past some of the most beautiful holiday light displays and elaborately decorated houses. Sing along to carols, enjoy cider and cookies and witness the island as it twinkles and glows. A beautiful sight to witness is the parade of lighted boats as they cruise along the Key West bight and harbor. It’s a tropical tribute to the season, including boats of all sizes and types, and is popular among locals and visitors. The parade takes place in mid-December. This annual hometown parade is fun for everyone. Marching bands, colorful floats and much more make their way down Truman to Duval. Be sure to catch this spectacle during the first week of December. Mile 0 Fest is a new music festival that takes place during winter at the Truman Waterfront Park Amphitheater. If you’re traveling to Key West in February or are considering a winter escape south, this is a “must-see” event, especially for fans of the Red Dirt & Americana scene. The main stages of the festival are located right off of Duval, but throughout the weekend you can catch sporadic acoustic sets at multiple theaters and bars. Take a self-guided tour through festively decorated Key West homes and gardens. Presented by the Old Island Restoration Foundation, this annual event takes place on select evenings in December. The breezes coming off the water are still pleasant during the winter in Key West. Experience the dazzling hues of orange, red and yellow as the sun sets over the water aboard a sunset cruise. One of the most popular cruises on the island, Fury Water Adventure’s Commotion on the Ocean includes live music on deck, so you can dance the night away as you chase down to world famous Key West sunset. 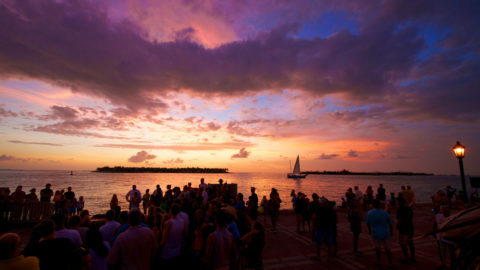 An annual favorite, the Conch Shell Drop is a New Year’s Eve celebration done in Key West style. Thousands of people gather on Duval Street as the giant man-made conch shell is lowered onto the roof of Sloppy Joe’s Bar. Come dance in the street, countdown to midnight and join in the revelry. The New Year’s Eve Shoe Drop is by far one of the most unique events on the island. A 6-foot high, red high heel shoe carrying famed drag queen Sushi makes its descent from the second story of the Bourbon Street Pub New Orleans House on Duval Street. Be a part of this unique celebration along with thousands of other party-goers. Get into the holiday spirit with a live concert at Truman Little White House – brought to you by the American Bombshells. Enjoy a tree-lighting ceremony and an inspiring performance of American classics and holiday favorites. These all-American singing beauties will amaze you with their voices and patriotic spirit.